This guide will help determine the correct way to set up the sync between your Intacct and Bill.com accounts, and provides important details to know before syncing. Currency Yes Yes - Multi-currency is not supported. Bill.com supports only one currency. By default it's set to USD, but it can be changed in Sync Preferences. Attachments No No Bill.com does not sync attachments to/from Intacct. Use Bill.com to directly upload attachments. If attachments also need to be in Intacct, upload in Intacct after each transaction has synced. Payables Vendors Yes Yes - Tax1099 works differently in Bill.com than Intacct. See best practices below to set up 1099 in Bill.com with Intacct. - The sync supports Intacct inactivation. The sync will inactivate the Vendor in Bill.com. Purchase Order Yes, once PO's are converted to unpaid bills N/A - The original Purchase Orders can not be viewed in Bill.com. PO's and Receivers can be converted to Bills and Vendors in Intacct. Once converted, the bill will sync into Bill.com. PO Bills can then be approved and paid via Bill.com. - The PO# must be in the "Reference Number" field of the bill/vendor credit in Intacct. The Purchase Order number will then appear on bills and vendor credits that originated from POs in Bill.com. Advanced Sales Tax N/A N/A Invoices cannot be created in Bill.com if using Advanced Sales Tax. Create invoices in Intacct with Advanced Sales Tax. The sync will bring them to Bill.com for payment. Items Yes Yes - The sync cannot bring the Chart of Account and Price fields of Items from Intacct into Bill.com. These fields are not exposed in the Intacct API. - Voided payments: Payments that have synced, and are then voided, will generate a sync error, instructing the user to manually void in Intacct. The ability to sync the void of a previously-synced AR payment is not available in the Intacct API. - Invoices created from SO's (and synced from Intacct) should not be edited in Bill.com, or sync errors will occur. Multi-Entity account syncs must follow Intacct's existing Root/Entity logic. For example, if you are syncing at the Root Level and create a Vendor, the Vendor will be managed at the Root Level, and cannot be edited at the Entity Level. Single-Entity account have no permission-level issues. Below is a table with all the configurations we support. They vary based on the complexity of the configuration. The sync will be limited to syncing transactions one way, from Bill.com to Intacct. Syncing transactions from Intacct to Bill.com isn't supported in this configuration. For the ideal integration for Configurations E and F, Lists and Transactions should be set up and managed at the entity level. If they are set up at the root level, use Configurations C or D to sync at the root level (in this case, updates made in Bill.com will not sync, and will create sync error notifications). Configurations C, D, E, and F assume that the multi-entity account is shared. 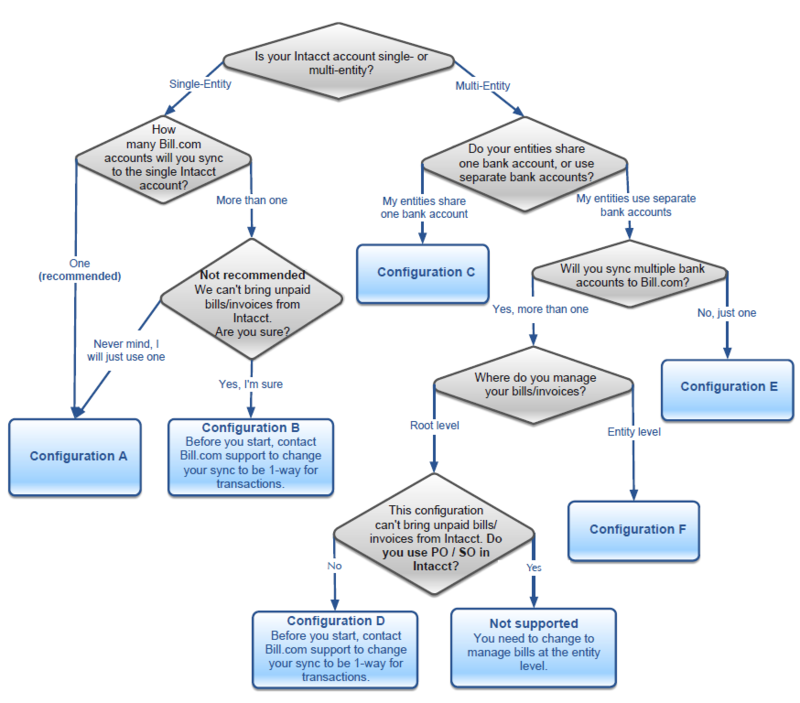 For Multi-Entity (Distributed), use Configuration A or B. Edits are based on permissions in Intacct. If set up in Entity, then ID, Name, and Contact should be unique. To make a Chart of Account type Bank or Credit Card in Bill.com, create a bank account or charge account in Intacct, and associate it to the corresponding Chart of Account. Bill.com tracks whether vendors are 1099 or not. Bill.com doesn't contain information about the 1099 box or type. Therefore, 1099 vendors created in Bill.com are synced to Intacct as form1099type=MISC and form1099box=7. If this default value is not what you need for your 1099 vendors, you should always create your 1099 vendors in Intacct so you can select the correct form type / box. Bill.com doesn't support selecting the form1099 per bill line item. Instead, you need to set the field 1099 Category on the chart of account(s) used on bills line item to any value other than "None" so they will sync as form1099=true to Intacct. Only unpaid bills sync from Intacct into Bill.com, so you should always initiate payments in Bill.com. On the Bill.com Pay page you can pay via Bill.com (check or ACH), select to print check in Intacct, or record payment made outside of Bill.com. The sync will send the related payment or check to be printed in Intacct. We can't update paid bills in Intacct. If you plan to re-classify bills in Bill.com after they are paid, you need to enable Re-classify transactions in your Intacct configuration to avoid sync errors. Any POs in Intacct will sync to Bill.com once they are converted to unpaid bills. Once they sync, they are ready to be approved and paid. In order for bills to sync seamlessly into Intacct, you’ll need to disable approval in Intacct. This option is found under Accounts Payable > Configure Accounts Payable > Payment Approval Settings section. You’ll need to uncheck the “Disable Approval” option. If you choose to have this option unchecked, you’ll need to approve all bills for payments to be recorded. Only unpaid vendor credits sync from Intacct, so you should apply vendor credits in Bill.com. When you make a payment with the vendor credit, we will sync it to Intacct where it gets automatically applied, based on the oldest available vendor credit. If you didn’t use the oldest available vendor credit when applying in Bill.com, you will need to manually update, in Intacct, which vendor credit was applied. Vendor Credits can sync to Bill.com but the application of the vendor credit is not supported. You will need to apply the vendor credit manually in Bill.com. Intacct adjustments don't sync. Negative bills do sync as vendor credits to BDC. Currently, Credit Memos don't sync to/from Intacct. They need to be manually applied in both Bill.com and Intacct. Always code the bill/invoice with an Account. The integration doesn’t sync the Account associated to the Item.